Step back in time on a visit to Hortulus Farm, a 100-acre 18th century farmstead featuring 20 separate formal gardens. Ponds, streams, woodlands, pines, fountains, and a kitchen garden are sure to pique your interest and the historic barns are home to a variety of farm animals. Enjoy a catered box lunch and time to shop in the greenhouse and nursery. Join us for this rare opportunity to take a guided midnight walk by the light of the moon and the stars. We will listen for frogs, owls, and also try to spy bats and inquisitive insects. This is an excellent time of night and year to see and hear these wonderful animals. Do not miss out! 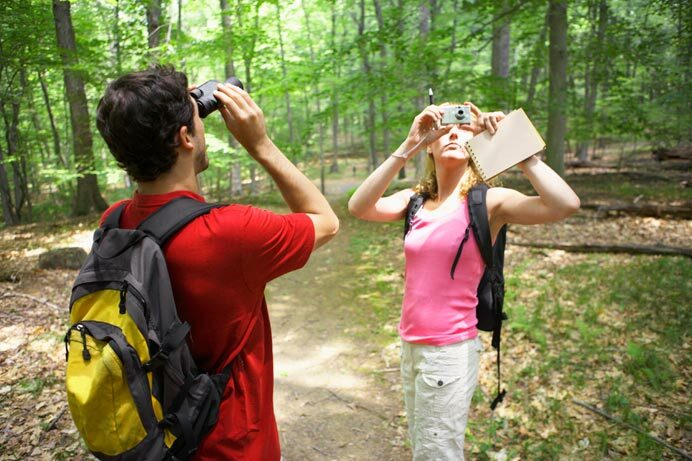 Spend the day with a Naturalist as we search for butterflies around the Delaware Water Gap. This area hosts a wide variety of species and is a great spot to begin our summer of butterflying! Make sure to bring plenty of water, sun protection, and a lunch. Spring brings new life to the swamp. Our summer birds return after being away for the winter. One little bird "flies" its heart out to come north and lay eggs – the hummingbird. We will look at the life of a hummingbird and try some of their challenges.